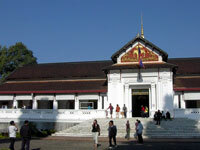 Luang Prabang's historic temple complexes are its main attractions. Many consider Wat Xieng Thong (Golden City Temple) to be the most magnificent of them. The nearby Royal Palace is another popular stop. Now a museum, its golden-spired stupa is one of the country's most iconic images. Visitors also enjoy Wat Wisunalat, which is the oldest continually operating temple in the city. Mount Phu Si sits across the river and has several temples on its slopes. The monastery on its summit is well-loved for its dazzling sunset views of the town's gilded spires. Otherwise, visitors typically delight in wandering through the picturesque district, watching life unfold on the riverbanks, shopping in the bustling markets and giving alms to monks. Early risers can enjoy an authentic slice of Laotian life by purchasing fresh produce near the Mekong River at Ban Pakam Market. The Night Market opens at dusk near Wat Mai and is a great way to end a day of exploring. On the culinary front, visitors will find a variety of quality restaurants. The city's menu ranges from traditional Laotian food to steaks, stews and baguettes. Vegetarians will do well. Culturally speaking, Luang Prabang's restaurant scene retains a clear French influence. Foodies will find French and French-fusion establishments, as well as glorious little bakeries that have a distinctly Parisian feel.